Center-pull towels combine the simplicity and convenience of a non-mechanized towel dispenser with the capacity of a jumbo towel roll. Using roll towels that offer a good size and absorbency, these dispensers are popular in classrooms and other high-traffic environments such as retail restrooms. 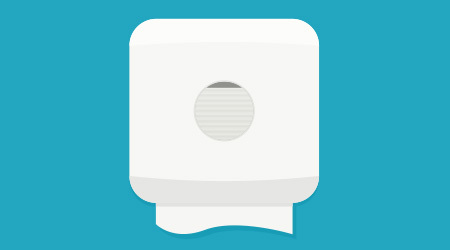 With a roll inserted vertically, sheets are pulled from the dispenser's bottom hole through the center of the towel roll, creating hygienic, touch-free dispensing that prevents cross-contamination. Single-sheet dispensation provides portion control, and most dispensers are a transparent plastic that allows janitors or occupants to see when the roll needs replacement.